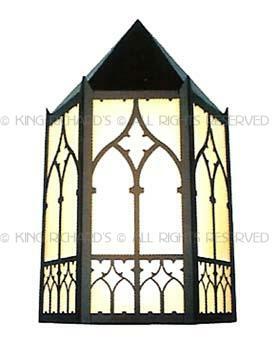 KRLTMS-05: New Yorkminster Interior or Exterior Wall Sconce. 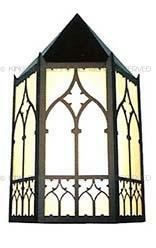 Three sided flush wall mounted exterior fixture shown here. Also available as a non-flush, six sided wall sconce with two tubular support stand-off arms. Seven finishes and two glass types for you to choose, or specify your custom finish. Pricing is dependent upon your size and custom specifications, so please call for assistance.